Many people have compared Atlantis to Cartagena but I shall review Atlantis from fresh as not everyone has played Cartagena (and will add a few notes about Cartagena at the end). In Atlantis, 52 stacks of tiles are laid out in a trail leading from Atlantis to the mainland with one water tile in the middle. The tiles are either in stacks of two tiles or single tiles. Each tile shows one of 6 different symbols and each has a number on them from 1 to 7. 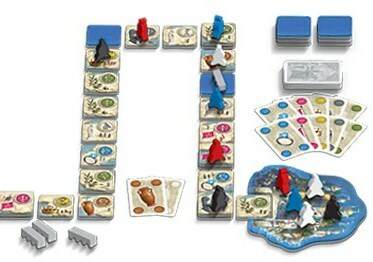 Players have three meeple (which they will move from Atlantis to the mainland) and a hand of cards which each show one of the different symbols. The goal: To collect as many points as possible.